A friend called me on phone now and called my attention to something she considered very important and vital. After her call, I had to check it again. I zoomed the two documents and discover she has a point. Curiously, I went to google, where I saw plenty of 2015 CoR issued by INEC to people, including President Buhari, low and behold, there is Nigerian coat of arm in all, but the invalid one that Uche Ogar has, does NOT have the Nigerian Cost of Arm on it. So I decided to bring the matter here for you people to fellow me and see. May be, am not seeing clearly. 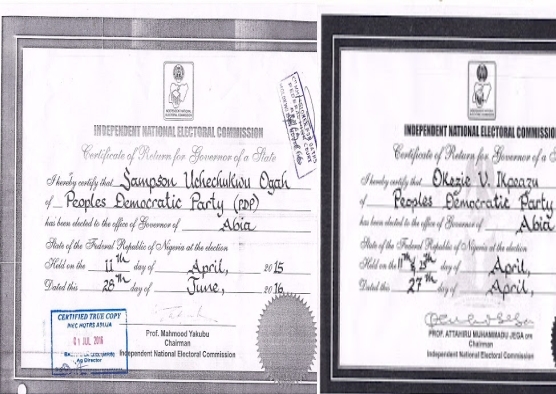 Here are two authentic CoR belong to President Buhari and Governor Ikpeazu issued by INEC. I have also provided the invalid document which was purportedly issued to Ogar (a photocopy one that we have certified, and a color one that Ogar uploaded on net).